Feature Friday: Are We On Time? This week I am featuring an amazing blogger who is new to the whole scene but will definitely make an impact. The lovely, the amazing Zoe of Are We On Time?. She writes about fashion and I really liked the photos from her post on London Fashion Week. She is not only a blogger, but a singer as well. After I got her entry, I watched a few of her videos and I loved them. She has such a lovely voice; you should definitely listen to her on youtube. Blog Name: Are We On Time? 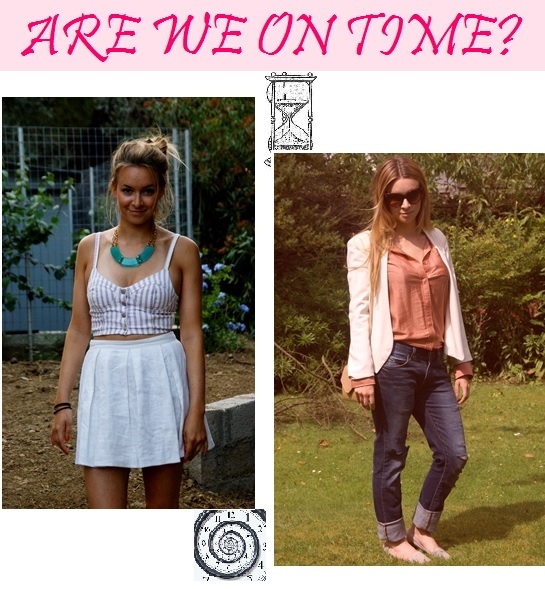 Are We On Time is a blog about Fashion: personal style, trends, designers etc, but it's not just a fashion blog. I write about photography, arts and music too, in an attempt to show that, although it is important how you present yourself, fashion isn't the only important thing. I don't know how successful I am though! I actually had a blog before this one called Intrepid Inspirations, which I started whilst on my travels in Israel to keep my friends at home updated. But it fell by the wayside when I got back home and started university. I'm not really sure how I got back into blogging, but I decided to take a different approach this time. My first few posts had nothing to do with fashion, and I took a more loquacious path to my posts instead of just posting pictures. I also adopted a different photo editing style which you can see in a few of my posts. This has actually been a pretty longwinded way of saying that a friend of a friend has a blog called Devil's in the Detail, and she inspired me to start my first blog. I love the community sense, and the fact that you can look at hundreds of blogs and keep finding the same ones coming back around - it means that they're all connected. I also love how much attention people pay to other people's blogs. It has also given me the opportunity to do some writing for online magazines, which I wouldn't have been offered were it not for my blog. Wow, I don't really know at the moment. I guess I should have some aims..! What I would really like to do is be able to widen my audience further than fashion readers. I want photographers, food-lovers and art fanatics to read it. I'd also like to have a meetup with British bloggers, because the US gets all these conferences and I can't go that far to get to them! So if there are any London based bloggers who would like to help me organise something, let me know! I saw an article in a London magazine talking about "Slashies", young people who have multiple jobs because of the current economic climate! I haven't got a job at the moment, but I see myself as a future-slashie, if that's a thing! I am also a singer and write my own music (http://www.youtube.com/user/ZoeRpaskett?feature=mhee) and that's my big passion. 3. I have no pets, but have my next name prepared should I get one soon: Dennis Linderhill.